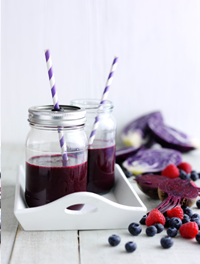 Sort out those New Year hangovers and January blues with this vitamin and antioxidant bursting berry juice. Full of natural sugars it will soon boost energy levels leaving you feeling brighter and revitalised. Cut the red cabbage and beetroot into pieces that will fit in your juicer shoot then press through an electric juicer. 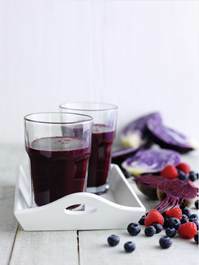 Puree the raspberries and blueberries with a little of the red cabbage and beetroot juice in a liquidiser until smooth then add the remaining juice and sweeten to taste with honey. Pour into two glasses and serve immediately or pour into a sports drinks container, seal well and take to the gym for a post workout energy boost. If you don’t have a juicer then puree the raspberries and blueberries with 300ml (1/2 pint) bought cranberry and raspberry juice or pomegranate juice. Super quick and easy to put together, simply unroll readymade puff pastry and cut into heart shapes with a knife. You don’t even need a special cutter, just draw a heart shape that is about 12cm (5 inches) long and the same wide on a piece of baking paper or piece of card and use this as a template. Preheat the oven to 200°C (180°C fan), Gas Mark 6. Heat the oil and butter in a frying pan, add the onion and fry for 5 minutes, stirring until softened. Add the sugar and fry for 5 minutes, stirring more frequently until lightly browned. Mix in the blackberries and thyme then season with salt and pepper. Unroll the pastry then cut 4 heart shapes, transfer to a wetted baking sheet and prick the centre of each heart with a fork, leaving a border about 2cm (3/4 inch) all the way round. 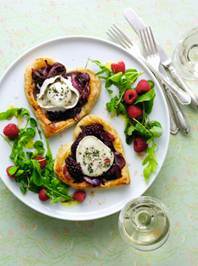 Brush the pastry with beaten egg then pile the onion and blackberry mix in the centre of each pastry heart. Bake for 10 minutes until the pastry is well risen and lightly browned. Top each with a slice of goats cheese, a few extra thyme leaves and some salt and pepper. Bake for 4-5 minutes more until the cheese has just softened and the pastry is cooked. Meanwhile, fork the vinegar, oil, sugar and mustard together in a bowl to make a dressing. Add a little salt and pepper then the salad leaves and raspberries and gently toss together. Arrange one heart per serving for a starter, two for a main course on to plates with a little salad. If you have some raspberry or blackberry vinegar then use this to make the salad dressing with. Extra special valentine/Mother’s day special. Wow the special person in your life with this impressive looking cake, this classic French recipe has a few short cuts, so you don’t need to be a master baker to make this version! Preheat the oven to 170°C (150°C fan) Gas 3. Grease a 20cm (8 inch) heart shaped springform tin with a little oil then line the base with a piece of non-stick baking paper. Add the margarine, sugar and flour to a large bowl, electric mixer or food processor. Add the baking powder, lemon rind and eggs and beat together until smooth. Spoon into the lined tin, level the surface and bake for about 35-40 minutes until well risen, golden brown and a skewer comes out cleanly when inserted into the centre of the cake. Leave to cool for 10 minutes then loosen the edge, remove the tin and lining paper and cool on a wire rack. When the cake is cold, cut into two thinner rounds, trimming the top level if it is a little domed, then spoon the limoncello over the cut sides. Wash the cake tin and line the base and sides with two strips of clingfilm. Put one of the cake halves in the tin and pull up the clingfilm if needed so that it slightly overhangs the top of the tin. Not a fan of marzipan then simply leave it out and spread the top of the cake with melted chocolate or simply dust with sifted icing sugar instead. To make chocolate hearts, melt 50g (2oz) dark chocolate in a bowl set over a saucepan of very gently simmering water. 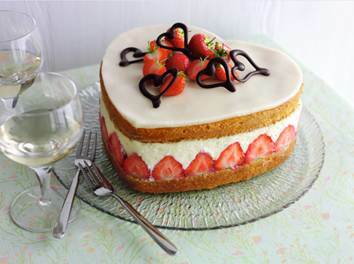 Spoon into a piping bag made of non-stick baking paper, snip off the tip then pipe heart shapes over a sheet of non-stick baking paper set on a baking tray. 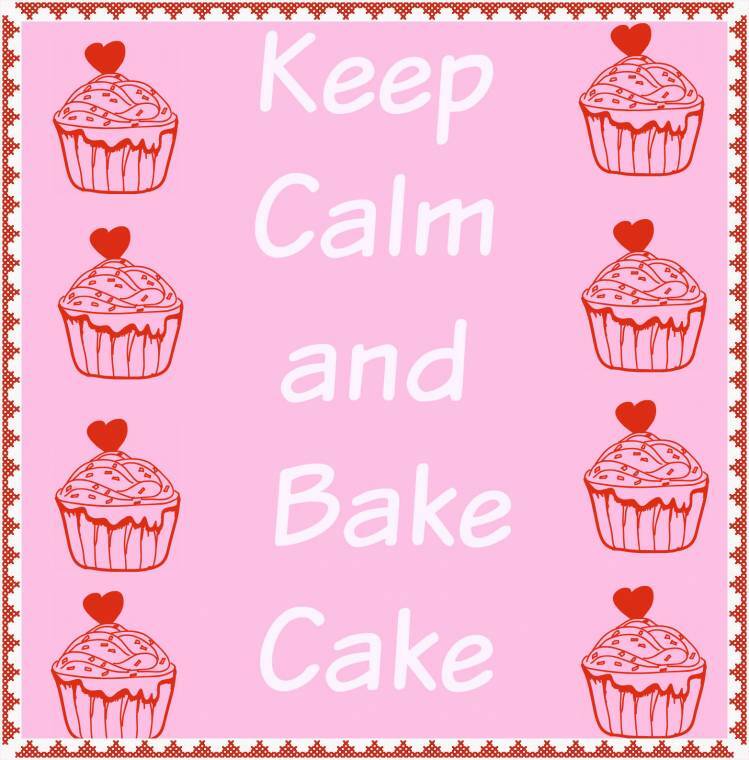 Chill until set then peel off the paper and add to the top of the cake when ready to serve. Blueberry and yogurt American style pancakes. Gluten free. Start your day right with these quick and easy pancakes that all the family can enjoy, even those on a gluten free diet. Mix the flours, cinnamon and bicarbonate of soda together in a bowl. Add the yogurt and eggs and whisk together until smooth then fold in the blueberries. Heat a little of the oil in a large non-stick frying pan, wipe out the excess with a piece of crumpled kitchen towel. Drop large spoonfuls of the thick batter into the pan and cook for 23 minutes until bubbles can be seen and the undersides are tinged brown. Turn the pancakes over with a palette knife and cook the second side for a minute or two. Take out of the pan and keep hot in a folded napkin. Oil the pan once more and cook more pancakes in the same way until all the mixture has been used up, lowering the heat slightly if needed. 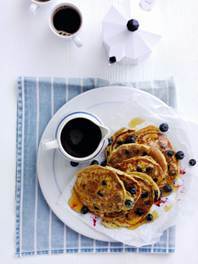 Stack the pancakes on to plates, top with a little butter, extra blueberries and a drizzle of maple syrup or honey. Fine cornmeal can be found in Indian supermarkets and some larger supermarkets, tapioca flour from your nearest health food shop. What’s In My Make Up Bag!?.. "20 Songs On My iPod : For The Gym.."
That cake looks lovely! I love berry smoothies!